The hip joint is a ball and socket joint where the head of the femoral bone (the thigh bone) is the ball that fits into the socket present in the pelvic bone called the acetabulum. The wide range of motion afforded by the hip joint is second only to the shoulder joint, which is the most mobile joint in the human body and is due to the muscles that surround the hip. Space is maintained between the head-neck junction of the femur and the acetabulum, by having the neck displaced off centre, by about 9mm, in relation to the femoral head. The fibrocartilage labrum, which is a shock absorber and hip stabilizer by acting as a fluid seal, is normally attached to the rim of the acetabulum and has a triangular cross section. Incorrect displacement of the head on the femoral neck, either centrally along the neck axis or towards the lower back end. Excessive coverage of the acetabulum due to tilting of the acetabulum, which affects the space between the femoral head and the acetabulum. The rim of the joint is lined with fibrocartilage called labrum, which deepens the joint and increases stability. The contact surfaces between the head and the inside of the socket, however, are lined with hyaline cartilage to dissipate forces during hip movement and load bearing. Pincer impingement – Typically described as the result from over-coverage of the femoral head, this over-coverage occurs because of the excessive prominence of the acetabulum rim, which may be focal or global. It may also be referred to as the rim impingement. This over-coverage leads to the damage of the labrum as the excess rim makes contact with the femoral neck. Its prevalence is not gender specific, and typically symptoms appear in middle-aged people. Cam impingement – this results from a non-spherical femoral head rotating in the acetabulum, which also damages the labrum and the acetabular articular cartilage. It is also called the femoral-sided impingement. It affects more men than women (3:1) and oftentimes symptoms are present from early adulthood. Combined impingement – Both pincer and cam impingement can occur, either as equal contributors to joint damage or with one type predominating. Early onset arthritis in adults in their forties or fifties is often due to the process of hip impingement (FAI), and can cause serious joint damage in athletes in their twenties and thirties. Family history – patients with siblings with femoroacetabular impingement are 2.8 times more likely to develop cam impingement. Physical stress and trauma during skeletal development – one study found that ice hockey players whose skeletons were still immature had a higher prevalence of femoroacetabular impingement compared to controls. Groin pain – the pain worsens when sitting down or getting up from a seated position, getting in and out of a car, or leaning forward. The pain may radiate to the front of the thigh or to the side. The patient may experience an inability to perform activities that require high hip flexion, such as squatting, or prolonged sitting. There may be painful clicking, locking or instability due to a labral tear that occurred as a result of hip impingement. There may be a reduced range of motion, especially for movements involving flexion (that is, bending at the hips) and internal rotation. The typical patient profile for FAI is young, active adults and middle-aged adults. There are a number of clinical tests that can be performed which, when accompanied with the clinical history, can be helpful in diagnosing FAI (hip impingment). One particular test is more of an observation, where the individual holds the side of their hip just above the greater trochanter, gripping it in such a way that the thumb and index finger form a C. This test is called the C sign. Another test, called the impingement sign, has the individual lying down and facing upwards. The knee is then brought up to the hip (that is, the hips are flexed) and internally rotated. A sudden, sharp pain, is a positive sign of impingement. This is probably the most important test, as 90% of patients that give a positive sign for this test are later confirmed, either by radiologically or surgically, to have hip impingement. It is also possible for pain to be elicited for a flexed hip that is externally rotated. This test is called the FABER (Flexion Abduction External Rotation) provocation test. Another test that involves external rotation is the posterior inferior impingement test, where the leg is extended and hanging over the end of the bed, and the hip is externally rotated. After clinical testing, there needs to be radiographic imaging done. It should be noted however the FAI can present a normal radiograph, and so should be assessed taking the clinical history and the results of the physical tests, especially a positive impingement sign, into consideration. Treatment of hip impingement (FAI) is still evolving, and although first line treatment is usually conservative, with the use of physiotherapy and anti-inflammatory drugs, the surgical delay may allow the disease to progress beyond the point where the joint cannot be preserved. This risk has some experts advising only surgical treatment for those patients clinically and radiographically diagnosed for FAI. Arthroscopy can be utilized to repair or remove damaged soft tissue and delay or prevent the onset of osteoarthritis. Open hip dislocation, however, is the most popular surgical approach to treating FAI, with a success rate of 70% to 80% in the short- to mid-term. Byrd, J. W. (2010) Femoroacetabular impingement in athletes, part 1: cause and assessment, Sports Health 2, 321-333. Wilson, J. J., and Furukawa, M. (2014) Evaluation of the patient with hip pain, Am Fam Physician 89, 27-34. Sullivan, J. P., Munch, J., O’Sullivan, E., and Kelly, B. T. (2015) Femoroacetabular impingement Springer, Switzerland. Leunig, M., Beaule, P. E., and Ganz, R. (2009) The concept of femoroacetabular impingement: current status and future perspectives, Clin Orthop Relat Res 467, 616-622. 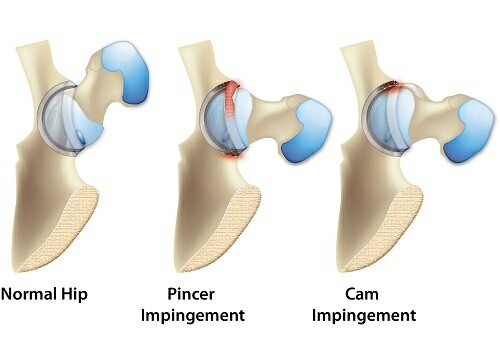 Kuhlman, G. S., and Domb, B. G. (2009) Hip impingement: identifying and treating a common cause of hip pain, Am Fam Physician 80, 1429-1434.